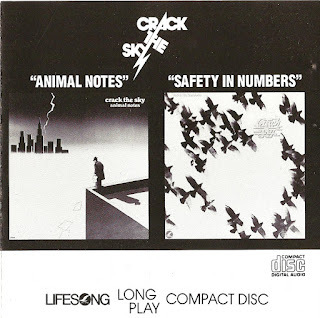 Coming as it did after Crack the Sky's critically acclaimed first album, the darker, more cynical Animal Notes was something of a shock. The grim lyrics are still expressed with a dash of humor, but on the first four songs, the laughs are through clenched teeth. "We Want Mine," the opening cut, is a demand from a third-world native for a share of the world's wealth, a demand he knows will be ignored. "Animal Skins," which may be the best track on the album, skewers organized religion with bitter wit, and "Maybe I Can Fool Everybody Tonight" is told from the viewpoint of someone who is sure that his success is undeserved. Not until halfway through the album is there any lighter material, in the form of "Rangers at Midnight," a goofy pseudo-soundtrack about the Mounties. The remainder of the album is lighter in tone but the lyrics are oblique; "Virgin...No" sounds fantastic, all stellar harmonies and guitar hooks, but the vague verses seem to have no relation to the upbeat chorus. After the bright throwaway pop of "Invaders from Mars," lyricist John Palumbo returns to the bleak outlook of the first half with the somber "Play On." Palumbo left the band halfway through their next album and recorded a solo album of pained, introspective material, and his career direction can be seen in most of Animal Notes. It's generally a bad sign when the lead singer quits a band in the middle of an album, especially when that singer wrote every song on the band's previous two albums. 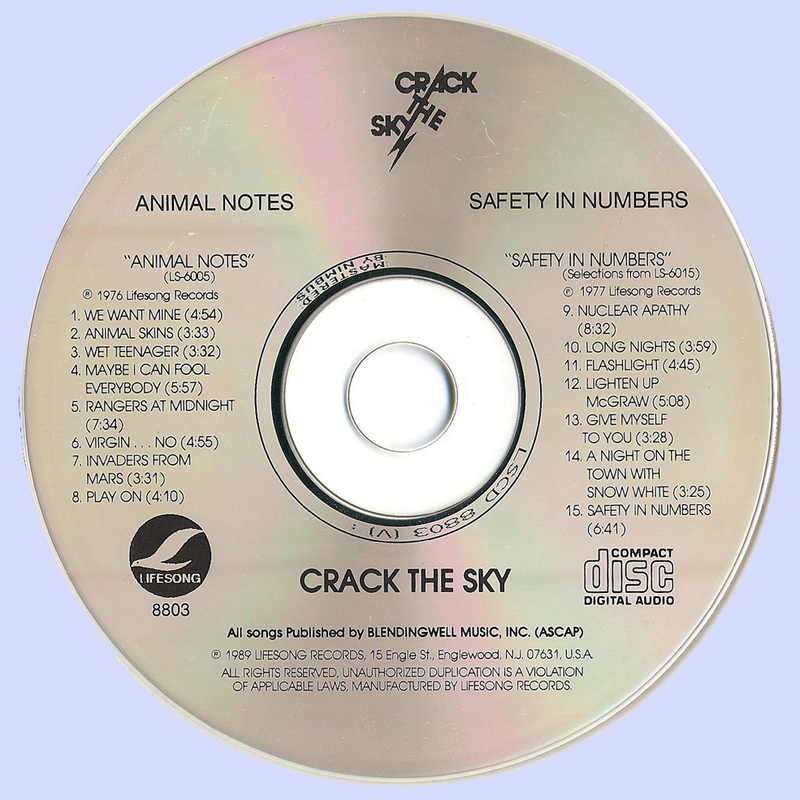 It is therefore somewhat surprising that Safety in Numbers was not merely a good album, but one which rivals Crack the Sky's award-wining first release. Though departing leader John Palumbo contributed a few vocals before quitting the band, new singer Gary Lee Chappell and other bandmembers filled in nicely on a mix of Palumbo's songs and new tunes written by guitarist Rick Witkowski and various partners. The two songs written by Palumbo aren't even the best -- that distinction would have to go to "A Night on the Town (With Snow White)," a delightful piece that mixes styles from the 1920s and progressive rock in a way that is probably unique. There are other lyrical gems here too, including the grim title cut and the sarcastic concert favorite "Lighten Up McGraw." Palumbo's "Nuclear Apathy" is five minutes of good song stretched to eight minutes, though the splendid guitar work and inspired arrangement does much to redeem the error. 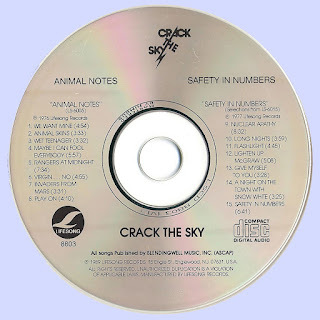 Taken as a whole, Safety in Numbers showed that there was more to Crack the Sky than John Palumbo, and that the band was ready to carry on in high style.